I get a weekly online newsletter from OraMD (they sell essential oil drops for teeth brushing and maintaining oral health). And their latest issue had an article I'm betting interests more than just me, so I wanted to pass it on: dealing with age spots naturally. Because there's more to healthy-looking skin than a minimum of wrinkles (they aren't the only face-ager), the article focuses on sun spots (age spots, or liver spots). These also make us look older than we actually are. 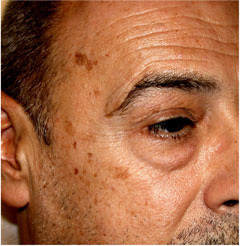 Aging spots are brown marks on a person's skin that come from accumulation of excessive melanin and are usually an aftermath of a lifetime of excessive sunlight exposure. They are also very hard to get rid of because, unlike conventional skin problems, age spots are an accumulation of skin pigments and milonocytes, and they require a lot of attention. Besides sun damage, though, age spots can be symptoms of dietary imbalance and even nutritional deficiencies. And it's this nutritional deficiency that caused them to be named "liver spots." If the oxidation process in a person's body has accelerated for some reason, then this condition often develops. 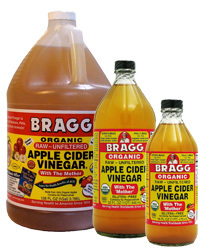 They are a sign of increasing toxicity levels in the liver which the body is unable to cleanse. Increasing anti-oxidants in your diet is the best way to minimize internal oxidation and liver toxicity, and does a lot to keeping age spots at bay. Age spots are completely harmless and look like flat yellow or brown discolored areas on the skin. They typically appear after the age of 40. (Although they're generally harmless, do consult your doctor if these marks change color or texture because this is a possible symptom of skin cancer.) However, despite being a benign condition, most of us aren't crazy about liver spots, and some folks choose to have them removed by electrosurgery, laser treatment, or cryotherapy. But if you'd rather not go the medical route to correcting this annoying condition, there are natural, non-intrusive remedies that aren't as expensive or extreme. First understand that age spots are created over a long span of time so their cure also requires some time to take effect—patience is needed with this approach as this cure can take several months. Next, get in the habit of regularly using sunscreen with at least an SPF of 15 as a preventive measure to stopping new age spots from appearing. 1. 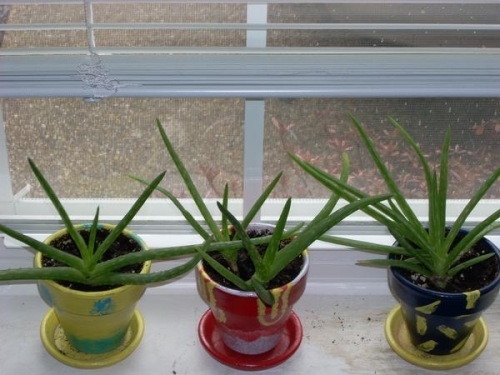 Look to aloe vera. This healing plant is the skin's best friend (which also cures or minimizes burn marks). Keep a plant on your kitchen windowsill and apply this gel twice a day on your spots; leave it on for 45 minutes. You can also apply it at bedtime to lighten age spots while you sleep. And know that beautiful skin starts from the inside, so consider adding an aloe leaf to your green smoothie each day. Aloe on the outside, aloe from the inside—your skin will thank you. 3. 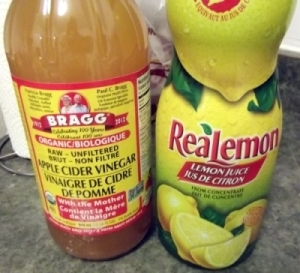 And get in the habit of applying a teaspoon of lemon juice mixed with apple cider vinegar to your skin twice a day to also reduce age spot appearance. (As the picture shows, it doesn't even need to be fresh lemon juice!) And speaking of lemon juice, because it is a strong cleansing agent (due to its citric acid), it also reduces or minimizes spots. Just rub fresh lemon juice on the age spots at bedtime and wash it off in the morning. 4. Finally, just like lemons, the vitamin C from onion juice is also a natural skin lightener, so rubbing it on age spots twice a day can make a difference. 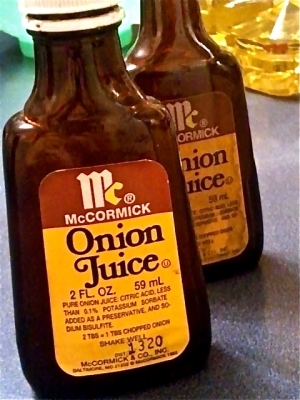 And onion juice mixed with apple cider vinegar is also effective in reducing age spots. Apply it for 30 minutes once a day and continue for six weeks. With these simple home remedies, age spots can be decreased to a negligible level and with constant care, they can be completely cleared away.